Diabetes mellitus (DM) represents one of the major chronic health problems faced by the society today. The incidence of DM worldwide, and especially in India, is on a steep rise. As per World Health Organization estimates, it could rise to 333 million in 2025. Predictions also show that 70% of those affected will belong to the developing world. DM is one of the most frequent metabolic disorders with an estimated prevalence of 7% in industrialized countries, of which nearly half the cases are undiagnosed. Emerging trends have placed oral physicians at the forefront in diagnosing DM, control the illness, and help those with prediabetes avoid full onset. It is undiagnosed in approximately half of the patients actually suffering from the disease. Gingival inflammation with or without the complicating factor of DM is known to produce ample extravasated blood during routine probing and is less traumatic than a finger puncture with a sharp lancet. Diabetes and periodontitis seem to interact in a bidirectional manner. A lot of diabetic patients undergoing dental treatment need to be first ascertained of their existing blood sugar level, so that appropriate treatment strategies can be provided to the individual patients. For this, they need to provide blood sample after a small prick. However, in such patients, this small amount of blood can also be obtained by simply probing the periodontium without any discomfort to the patient. Periodontal examination as a rule comprises careful probing of periodontal pockets which result in some amount of bleeding from the gingival sulcus. Instead of swabbing and disposing the gingival crevicular blood (GCB), this can be employed to assess blood glucose by glucometer. Glucometers are reliable, rapid, affordable, and commonly used for blood glucose determinations in diabetes screening and domestic monitoring. When utilized in a dental office, such a system may offer a more objective parameter in the diagnosis of DM. Various studies have been conducted to assess the use of this GCB with self-monitoring devices in the dental office to measure blood glucose. Many studies showed the efficacy of GCB as a alternative to venous or finger prick blood for blood glucose estimation where GCB was collected either directly through glucometeric test strips or by capillary tube from the gingival crevice and levels were measured. This study is unique and was done to prove GCB collected through both the techniques produced equally effective results. In many previous studies, only capillary tube method was used to collect GCB to avoid possible contamination of saliva. Hence, in our study, we have done collection of GCB by both capillary tube and direct glucometric test strip methods and compared the results with laboratory venous blood (VB) glucose levels to prove that direct glucometric method can be used for GCB collection which will be convenient, time saving, and easier than the former. Patients reporting as outpatient to Department of Oral Medicine and Radiology, Sree Balaji Dental College and Hospital, aged between 20 and 70 years for a period of 3 months were included in this study after obtaining informed consent. The study was commenced after approval from the Institutional Ethical Committee. Ethical approval for this study was provided by the Institutional Ethical Committee, Sree Balaji Dental College and Hospital, Bharath Institute of Higher Education & Research, Chennai, Ref No. SBDCECM105/13/43, November 11, 2013. A total of 50 patients who were known diabetic were included in the study. Patients 20 to 70 years of age. Patients who had moderate-to-severe grade of periodontitis who were already known diabetics under medication (oral hypoglycemics/insulin). Patients with underlying bleeding/clotting disorders like hemophilia, thrombocytopenic purpura, etc. A thorough case history was recorded followed by clinical examination. The periodontal status of the patient was recorded. Area to be examined was isolated using saliva ejector and cotton rolls. Probing was done using Williams periodontal probe to obtain sufficient amount of bleeding and site which had profuse bleeding was selected. GCB was collected for the same patient at the same site by two different methods. The glucometer was turned on with the reagent strip and directly placed against the bleeding site where blood was drawn by capillary action. The blood glucose levels were recorded for each patient. A plastic capillary tube of 2-mm bore marked up to 3 µl was kept in the gingival sulcus to collect the blood and was then transferred to the test strip of the glucometer to obtain the values. VB was drawn then to measure the VB glucose levels as a gold standard. The above-mentioned procedure was done for all the 50 patients, and the results were tabulated. Statistical analysis was done using the SPSS 22.0 (IBM,USA) statistical package. 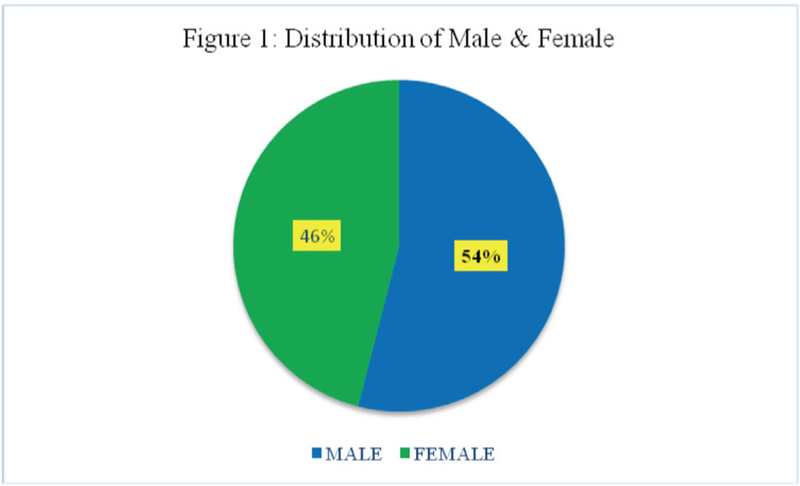 A total of 50 patients who were included in the study included 27 females and 23 males with a mean age of 49.14 [[Figure 1]]. Descriptive statistics was done for the variables. One-way analysis of variables (ANOVA) test was performed to compare the mean values of random blood glucose (RBS) (GCB) by direct intraoral, RBS (GCB) by capillary tube method and RBS (VB). The mean and standard deviation were 198.82, 199.02, 198.16 and 47.24, 47.5, 47.56, respectively [[Table 1]]. A statistically significant correlation of P < 0.05 was obtained proving statistically significant results [[Table 2]] and [Figure 2]]. Tukey post hoc analysis for multiple comparison was done, and none of the comparisons were statistically significant with P > 0.05 [[Table 3]]. There was no statistically significant difference found among the methods. The American Diabetes Association recommends screening for diabetes should start at the age of 45 years and should be repeated every 3 years in individuals without risk factors, earlier and more often in those with risk factors for diabetes. The primary methods used to diagnose DM and monitor blood glucose levels have traditionally been fasting blood glucose, a combination of fasting blood glucose with a 2-h test after glucose loading (2-h postprandial) and oral glucose tolerance test. Glucose testing with the Accu-Chek active (Roche Diabetes Care, Inc., USA) self-monitoring device is sensitive, as it can provide results with just 2 to 3 µl of blood within 5 s. Gingival blood glucose level (GBGL) collected during periodontal examination may be an excellent source of blood, safe, easy to perform, and comfortable to the patient. It is a reliable technique to use GCB sample to screen diabetes as there is not much of patient discomfort while probing and the time taken for probing and blood to ooze out through the gingival crevice is also less. A lot of research has been performed to estimate the blood glucose levels from the GCB through painless noninvasive techniques. Most of the studies were done using a fine capillary tube (2 mm) diameter to minimize the contamination of gingival blood with calculus, debris, or inflammatory exudates. A few recent researchers used the technique of placing the glucometric test strip directly in the gingival crevice to record the GCB values.,,, When there was proper isolation by cotton rolls and air drying of the surface where GCB, even in direct intraoral technique, there was less chance of contamination from calculus, inflammatory exudates, etc.Earlier only capillary tube method was used to collect the oozing blood through the gingival crevices.,, But it is a time-consuming procedure and chances of contamination are possible while transferring to the glucometric test strip. Though both the techniques were used widely to collect the GCB, no study has been performed to the compare these two methods to collect the GCB to evaluate the results obtained from both the techniques. Hence, this study was taken up to compare the GCB glucose values collected by both capillary tube and direct intraoral method. 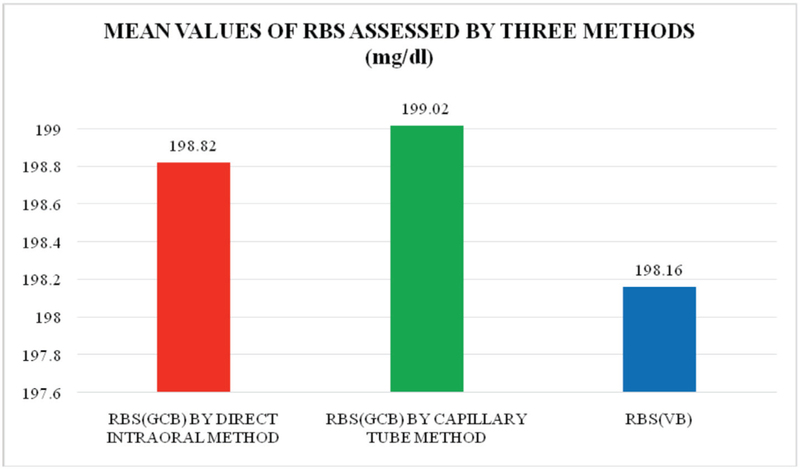 On comparing the mean values of RBS (GCB) by direct intraoral, RBS (GCB) by capillary tube method the results were statistically significant with (P > 0.05). Moreover, there was no statistically significant difference found among the methods when they were compared with the gold standard VB glucose levels. This clearly concludes that either of the above two techniques can be used for collection of GCB which will not affect the results. GCB collected by both capillary tube and direct intraoral method gave almost similar blood glucose results, which concludes that either of the methods can be used to collect the GCB sample. Moreover, direct intraoral method is time saving, easy to perform, and immediate transfer of the sample to glucometer minimizing chance of contamination. Narayan P. Diabetes may soon become a pandemic. Bangalore: The Times of India; March 7, 2006. Retrieved from http://epaper.timesofindia.com.2012. Beikler T, Kuczek A, Petersilka G, Flemming TF. In-dental-office screening for diabetes mellitus using gingival crevicular blood. J Clin Periodontol 2002;29:216-8. Kumar P, Clark M. Clinical medicine. 5th ed. Philadelphia:McGraw Hill, Saunders Elsevier; 2002. pp 1077. Stanko P, Izakovicova Holla L. Bidirectional association between diabetes mellitus and inflammatory periodontal disease. A review. Biomed Pap Med Fac Univ Palacky Olomouc Czech Repub 2014;158:35-8. Gupta A, Gupta N, Garg R, Jain N. Developing a chair side, safe and non-invasive procedure for assessment of blood glucose level using gingival crevicular bleeding in dental clinics. J Nat Sci Biol Med 2014;5:329-32. Kandwal A, Batra M. Gingival crevicular blood as a screening tool for diabetic patient: A randomized clinical trial. Ann Dent Speciality 2014;2:6-8. Ervasti T, Knuuttila M, Pohjamo L, Haukipuro K. Relation between control of diabetes and gingival bleeding. J Periodontol 1985;56:154-7. Rajesh KS, Irshana R, Arun Kumar MS, Hegde S. Effectiveness of glucometer in screening diabetes mellitus using gingival crevicular blood. Contemp Clin Dent 2016;7:182-5. Verma S, Bhat KM. Diabetes mellitus—A modifier of periodontal disease expression. J Int Acad Periodontol 2004;6:13-20. Singh A, Bhat N, Kahlon H, Gambhir RS, Sandhu AR, Jagpal JS. Screening for diabetic patients using gingival crevicular blood with a self monitoring device in a dental outreach program: A cross-sectional study. J Indian Assoc Public Health Dent 2017;5:210-3. Kaur H, Singh B, Sharma A. Assessment of blood glucose using gingival crevicular blood in diabetic and non-diabetic patients: A chair side method. J Clin Diagn Res 2013;7:3066-9. Debnath P, Govila V, Sharma M, Saini A, Pandey S. Glucometric assessment of gingival crevicular blood in diabetic and non-diabetic patients: A randomized clinical trial. J Oral Biol Craniofac Res 2015;5:2-6. Subodh A, Panchmal GS, Shenoy RP, Jodalli PS, Sonde L, Pasha I. Comparison of blood glucose level in gingival crevicular blood and tissue capillary blood in diabetic and non-diabetic patients. J Appl Dent Med Sci 2017;3:28-33. Meti Mangala, Praveenkumar SR, Kalburgi Veena. Screening for diabetes mellitus using gingival crevicular blood. J Oral Health Res 2010;1:160-4.